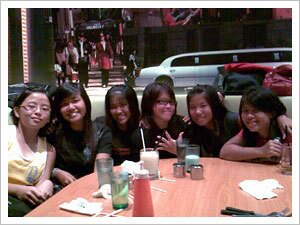 It seems like NYNY is our regular slacking restaurant after trainings. We went there again yesterday after polo just to sit, talk, and basically, slack. After that, Hafiz bro asked us if we wanted to go bowling. Initially, our plan for the day was to go bowling or play pool at Marina Square but we were all too tired and felt a tad lazy. That’s why we ended up at NYNY to begin with. Anyway, since Hafiz was treating the games while we forked out for the shoes rental, we went to bowl with him along with some of the seniors. Oooh i like your header image. Its really well done! You have great skills. Love your photos, looks like u had lots of fun. wow this really is a pretty design.. i love the colours! nice! Sounds fun. Cool pictures, you all look so.. unbored. Unlike me right now. Poor Jolene. I hope she didn’t feel too bad about not being able to play. I think I saw you on the train just now. You were wearing a red tee and alighted @ Bedok. Is that you? Haha..
thats awesome. sounds like you had a great time. You guys look like you’re having so much fun! And fairy floss? Yummy! You can never have too much fairy floss! Bowling sounds like a lot of fun. I’ve actually never been bowling before. It sure sounds like you guys had a lot of fun though! ohhh fun times! 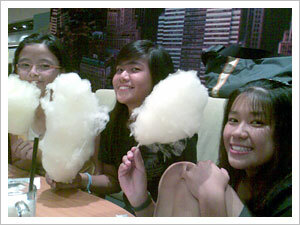 You call them candy floss…I’ve only heard it called cotton candy. Too funny. Love the pics.